RoboMail Mailing List Server | Inter7 Internet Technologies, Inc. Need a place to host your server? Ask us for our short list of preferred hosts. We can recommend professional, service-oriented, reliable hosts to make sure your campaigns keep running. Questions? 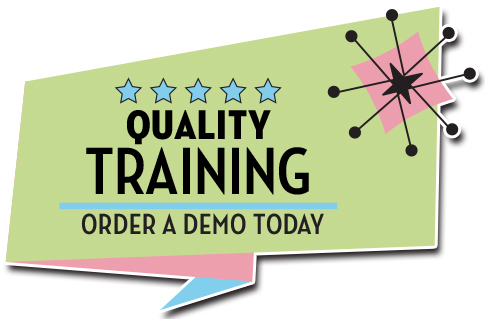 Ready to start a demo? Need more information about our $500/mo licensing? We may be at a trade show or hosted event near you. Our events are up to date on our main page HERE. Thank you for your interest in our software and services! Rotate, Randomize, Personalize: every component of the email. Real-time Reporting: track it all – opens, clicks, unsubs, complaints, FBL’s geotargeting, response times, etc. so you can mine your metrics for increased conversions. Subscribe to our internal list cleaning services with our community based resources for bad email discovery. Extend and Integrate: just set your server goals and send! Backup data using an encrypted connection. What can you expect from RoboMail? We have several different examples with dependencies involving hardware, bandwidth, valid recipient lists, size of email message, and number of IPs used. According to our throughput data on site, one RoboMail DLM Extreme Appliance can send about two million emails in one hour. ROBOMAIL DLM PRO ON ONE SERVER STATS 537,800 emails per hour and percentages. 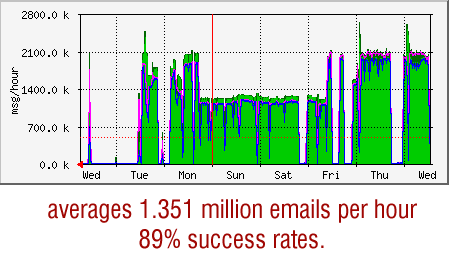 ROBOMAIL XTREME ON ONE SERVER STATS 1.3 million emails per hour and percentages. increases the relevance to the recipient. Therefore, painlessly enabling the sender to create targeted marketingcampaigns. Our staff also works closely with our customers and is kept up-to-date with the most effective targeted marketing techniques. CAN-SPAM is your friend The CAN-SPAM Act outlines what is acceptable email marketing. It bans false or misleading header information. Your email’s “From,” “To,” and routing information — including the originating domain name and email address — must be accurate and identify the person who initiated the email. While the ultimate burden is on the individual sender, RoboMail has always been legally compliant — and even includes dynamic unsubscribing and tracking to make following the guidelines fault tolerant and automatic. RoboMail is predefined in your installation to be CAN SPAM compliant. RoboMail Mailers perform well with standard IDE, ATA, SATA and SATAII drives. Fast hard drives like SAS or high speed SATA are recommened for the central robomail machine that runs the database. 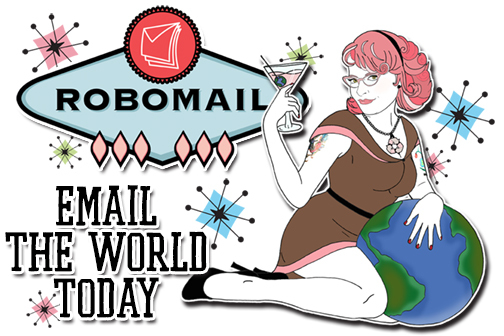 RoboMail sends millions of emails at blinding speeds, but what if you don’t have millions to send? What if your company has a newsletter of under 100,000 addresses but you still need to get the word out? We have the solution to your problem. Due to customer demand, Inter7 is providing a RoboMail version for lower-volume mailing. RoboMail Lite has been modified for lighter demand email campaigns with full featured list management. With all the of features of our DLM Pro, RoboMail Lite is ideal for tracking the effectiveness of smaller email campaigns without paying higher prices. A conflict of interest for us because we work with such sensitive and bleeding edge technology for our current and future robomail clients that we do not want to ever be even suspected of any improprieties. If you purchase software from another mailing provider, are not you competing for the same advertising space? This reason alone allows us to perform ever harder for our customers because it enables us to work with our clients freely, without prejudice on the improvements and productivity suggestions to our clients. Inter7 is strictly a software products, services and support business model. We do however have many clients who purchase and sell data, but we keep the identities of our customer base on a strict and private relationship. We believe it’s none of anyone’s business about your business. So how do you go about getting introduced to this tight net community? Many of these customers attend email and messaging trade shows were these types of dealings or business relationships can blossom.